Second stop on a visit to West London on Sunday after a Wetherspoon's breakfast at the Greenwood Hotel, Northolt. The Bridge House is located near to Little Venice in a prominent corner location. Similar to Mappiman, this wasn't really a place that floated my boat (or should it be barge?). It's a strange place. The theatre is upstairs. Downstairs feels more like a gastropub than a bar. There is a strange mix of furniture. Doom Bar appears to be the regular ale. Broadside & Ubu were the guests. The Broadside was very cloudy, either because it was the first one pulled through or it was the end of the cask. Either way, a disappointing visit. Not actually sure if this is a pub. Outside, it says "Canal, Cafe, Theatre"
Decided it wasnt really for me and moved on. Was very busy when I went there, not surprisingly as it was a sunny Sunday and this pub is just by Little Venice. Too busy for me so I had a half of TT Landlord in a plastic glass - you could get glass but only to use inside - and went out into the sun. Hard to tell how good a pub is when it is that busy really. 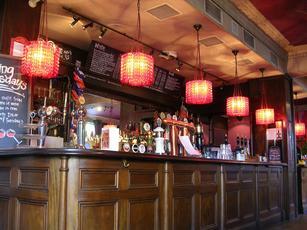 Tastefully designed pub which is popular with couple and groups. Both barmen provided such an inordinately slow service one gets the impression that it's intentional. Arranged to meet friends here for a quiet Sunday lunch and was very disappointed. The pub was relatively quiet yet the staff still managed to totally screw up a simple order for food. Beer was OK and you can't complain about the prices but there's plenty of keener competition to be had in the area.